Bank Negara Malaysia recently released detailed Shariah guidelines, requirements and optional practices and arrangements for various Islamic financial contracts, products and features. Following on from this, banks and financial institutions will be required to submit actions plans based around these requirements and practices. As such, a great deal of important information gathering and analysis will have to take place in a relatively short period of time. 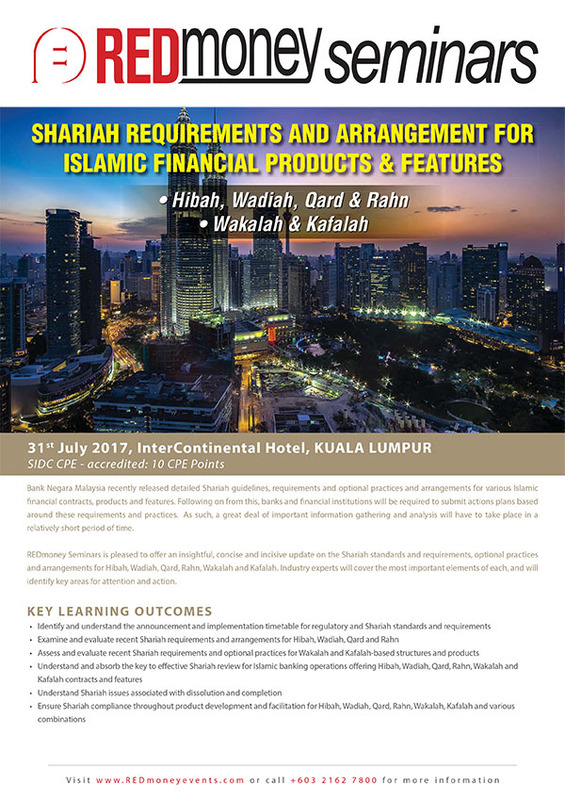 REDmoney Seminars is pleased to offer an insightful, concise and incisive update on the Shariah standards and requirements, optional practices and arrangements for Hibah, Wadiah, Qard, Rahn, Wakalah and Kafalah. Industry experts will cover the most important elements of each, and will identify key areas for attention and action. The seminar will be highly beneficial to anyone in a bank or financial institution involved in the structuring, development, marketing and risk management of Islamic financial products.